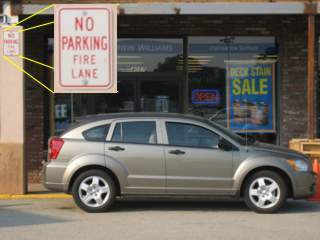 I've enlarged the sign in case you're having trouble figuring out what's wrong with this picture. The store behind the vehicle is a "Sherwin Williams" paint store. It must be some kind of wall coloring related emergency, I guess. I was visiting the record store next to this paint store, and the cashier says people park there all the time for the paint store. Actual parking spaces are only about 25 feet away, by the way.